Our paella is 100% gluten free, dairy free + we can alter our recipe to meet any specific dietary requirements. 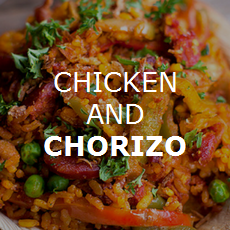 To make our chicken and chorizo paella, we use chicken, mild chorizo, garlic, fire roasted red and green capsicum, smoked paprika, peas, stock, saffron, herbs, seasoning + rice. 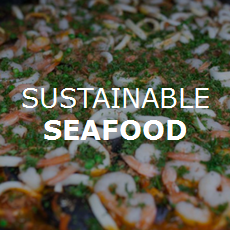 Our sustainable seafood paella is made using a blend of sustainable seafood (port Arlington mussels, locally caught Westernport calamari, and prawns) with chicken, mild chorizo, garlic, fire roasted red and green capsicum, smoked paprika, peas, stock, saffron, herbs, seasoning + rice. A vegan paella packed with goodness and flavour. 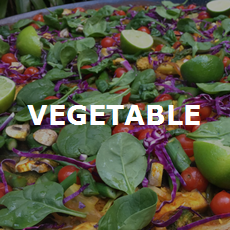 Depending a seasonality, here is a sample of the fresh ingredients that appear in our paellas: red peppers, green peppers, onions, green beans, peas, olives, zucchini, broccoli, eggplant, cauliflower, tomatoes, saffron, garlic, herbs, smoked paprika, vegetarian stock, herbs, seasoning + rice. 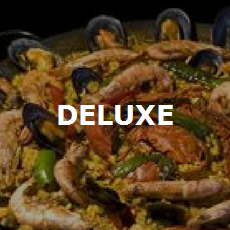 The deluxe paella uses shellfish with chicken and chorizo. A selection of seasonal premium shellfish which could include Moreton Bay bugs & crayfish (market price), whole large prawns, and mussels with chicken, mild chorizo, garlic, fire roasted red and green capsicum, smoked paprika, peas, stock, saffron, herbs, seasoning + rice. Look out for our Paella Special of the Day at Events and Festivals! Get in touch today to discuss how we can help cater your next event!